Flying Geese are twice as wide as they are tall. The larger square becomes the 'peaked' shape -- the geese (shown as dark patches in the block on this page). The smaller squares become the side triangles. The no-waste method produces four Flying Geese for each set of fabrics you cut. 1" x 2" 3-1/4" x 3-1/4" 1-7/8" x 1-7/8"
1-1/2" x 3" 4-1/4" x 4-1/4" 2-3/8" x 2-38"
2" x 4" 5-1/4" x 5-1/4" 2-7/8" x 2-7/8"
2-1/2" x 5" 6-1/4" x 6-1/4" 3-3/8" x 3-3/8"
3" x 6 7-1/4" x 7-1/4" 3-7/8" x 3-7/8"
3-1/2" x 7" 8-1/4" x 8-1/4" 4-3/8" x 4-3/8"
4" x 8" 9-1/4" x 9-1/4" 4-7/8" x 4-7/8"
4-1/2" x 9" 10-1/4" x 10-1/4" 5-3/8" x 5-3/8"
5" x 10" 11-1/4" x 11-1/4" 5-7/8" x 5-7/8"
5-1/2" x 11" 12-1/4" x 12-1/4" 6-3/8" x 6-3/8"
Add 1-1/4" to the finished width of a Flying Geese unit and cut one square with sides that size. 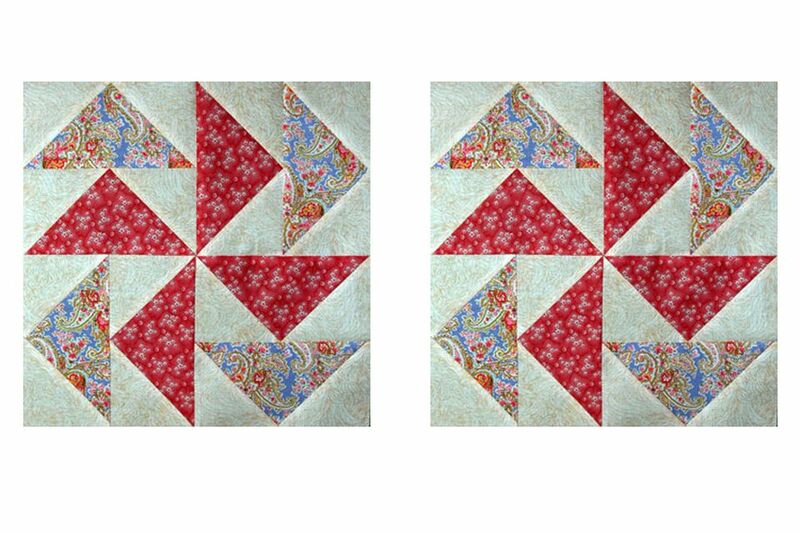 Add 7/8" to the finished height of a Flying Geese unit and cut four squares with sides that size. Flying Geese can also be constructed by sewing individual pieces of fabric together. When you use that technique the patches are easier to match up if you trim the long tips of triangles before you sew. Another method is often used to construct quick pieced Flying Geese. To make geese in that way you'll sew squares to the ends of rectangles in the same way we often make Snowball quilt blocks. It's a good option when you are sewing with small pieces of fabric or when you make a scrap quilt and don't need four identical geese. Do keep in mind that the method produces waste when squares are trimmed to create triangles after sewing. Special Rotary Rulers Can Help you Sew Flying Geese. To print this chart, see How to Print Quilt Patterns.